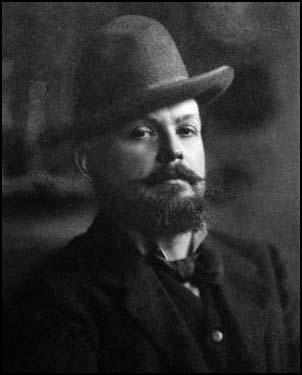 Frank Brangwyn, the first son of William Curtis Brangwyn (1839–1907), a Welsh architect, was born in Bruges, Belgium on 12th May 1867. His mother was Eleanor Griffiths, who came from Brecon. His biographer, Alan Windsor, has argued: "His parents were Roman Catholics. Brangwyn had two elder sisters and was followed by three brothers. His father, a follower of Pugin, had worked for G. E. Street before moving to Bruges, where he carried out a number of mural paintings, frescoes, and mosaics, as well as designing several important buildings and, according to his son, was responsible for the reconstruction of the monastery church of St André (Sint-Andries). He also designed textiles and ran a workshop in which local craftsmen were trained." The family returned to London in 1875. His father sent him to draw in the South Kensington Museum (Victoria and Albert Museum). During this period he met Arthur Heygate Mackmurdo, a protégé of the art critic, John Ruskin. 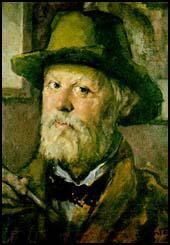 Mackmurdo introduced Brangwyn to William Morris, who employed him (1882-1884) as a glazier. Brangwyn also began painting and gained a reputation for seascapes and landscapes. In 1885 he exhibited and sold A Bit on the Esk at the Royal Academy. In 1888 he visited Constantinople. Back in England he painted Burial at Sea (1890). The following year it was awarded a medal at the Paris Salon. In 1890 he embarked on a long sea journey along the coast of Spain, Tunis, Tripoli, Jaffa, Izmir and Trebizond. On his return in 1891 he held his first one-man show, From Scheldt to Danube, at the Royal Arcade Gallery in Bond Street. He also began to do illustrations for The Graphic and The Idler. A great admirer of Eugène Delacroix, in 1892 he produced The Slave Market and The Buccaneers. In 1895 the French government purchased Market in Morocco. The same year saw Siegfried Bing commission Brangwyn to decorate the façade of his new art gallery, Maison de l'Art Nouveau, in Paris. He was invited to become a guest member of the Vienna Secession and was invited along with other foreign artists, such as Auguste Rodin and James Whistler, to exhibit in their first exhibition in 1898. During this period Brangwyn illustrated several books including Collingwood (1891), The Captured Cruiser (1893), The Wreck of the Golden Fleece (1893), Tales of Our Coast (1896), The History of Don Quixote (1898) and A Spiced Yarn (1899). In 1901 Brangwyn was commissioned to produce a murals for the Great Hall of the Worshipful Company of Skinners. This was followed by a mosaic for the apse of St Aidan's Church in Leeds, a mural for the British Rooms at the Venice Biennale, a painted frieze at the Palazzo Rezzonico, Venice and his friend, Robert Hawthorn Kitson, who commissioned him to design the panelling, table, sideboard and chairs and a mural at the Casa Cuseni, Taormina, Sicily. During the First World War Brangwyn produced over 80 poster designs that encouraged men to join the armed forces and to warn about the dangers of Zepplins to the home population and the need to buy war bonds. 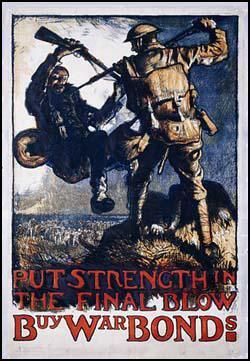 One poster, Put Strength in the Final Blow, caused deep offence and Kaiser Wilhelm II is said to have put a price on Brangwyn’s head after seeing the image. In 1926 Lord Iveagh commissioned Brangwyn to produce a series of large murals to cover the north and south walls of the royal gallery in the House of Lords. His biographer, Alan Windsor, has pointed out: "Brangwyn first designed a series of compositions based on scenes of battle, to harmonize in subject matter and colour with the existing long murals by Daniel Maclise, which are on the east and west walls. After Brangwyn had worked for two years, however, Lord Iveagh could not accept the grim realities depicted and asked Brangwyn to start afresh on a quite different scheme. The new series, in radiant colours, was to evoke instead the beauty of the dominions and colonies which had fought for the British. These, the British Empire Panels, are a celebration of the people, the flora, and the fauna of those lands in a profusion of mainly tropical vegetation. They are flamboyant, flat, and decorative in their effect. In 1930 five of the sixteen large panels were set up in the royal gallery for inspection by the Royal Fine Arts Commission. Their report was adverse. Despite vigorous public support from Royal Academicians, including Sickert, the Lords voted against the scheme. Brangwyn was devastated by this blow." These murals can now be seen at Brangwyn Hall in Swansea. By the 1930s Brangwyn's art went out of fashion and he retired to his home at The Jointure in Ditchling. His biographer has argued that he suffered from "an increasing pessimism and hypochondria" and "was saddened and angered by developments in modern art; he was aware that his work was now ignored by many critics or regarded as old-fashioned." 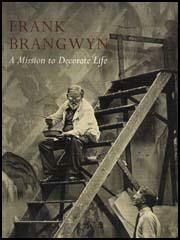 Brangwyn was knighted in 1941 and in 1952 the Royal Academy held a retrospective of 470 of his works. 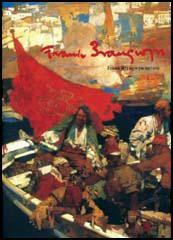 Frank Brangwyn died at his home on 11th June 1956.